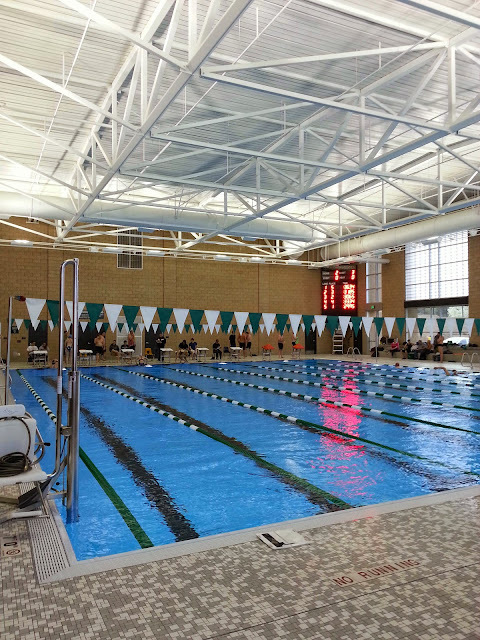 Saturday was the Utah Masters State Championship Meet at the brand new pool at Olympus High School. Even though I didn't get the times I was after, it was a fun meet and a beautiful pool. I finally got to meet Donald Barrus, who is a member of SLOW who lives in Wyoming. He's a nice guy and I had a lot of fun talking to him. Other SLOW members who were at the meet were Gordon, Goody, and Kevin Johnson. Some of my Fairmont teammates were also there: Chris, Steve, Marie and our coach Max. There were a lot of other swimming buddies there that I had fun catching up with and watching them swim. Going to a Masters meet is pretty inspiring. I think a lot of people are turned of by "Masters" thinking that it's all ex-college swimmers or something, and it's really not the case. There are all types and abilities who participate. There was even an 80+ year old lady competing! It was awesome to watch her swim and I hope I am still entering meets at that age. I had a bunch of other things going on that afternoon, so I was only able to swim two of the four events I had registered for: 50 free and 100 free. I knew as soon as I got in the pool to warm up that I probably wasn't going to get the times I wanted. I just felt off. I probably should have gone to practice on Friday and just warmed up instead of taking the day off. On the 50 free I was shooting for a qualifying time for short course nationals (even though I'm not planning to go to the meet). I'm right on the edge of two age groups and the time to get was 25.14 for my current age group and 25.36 for the age group I will soon be in. I ended up getting 25.57, which isn't bad, but I know I can make both of those qualifying times. On the 100 free I was also shooting for a qualifying time, although this was much more of a long shot. The qualifying times are 55.27 (too fast for me right now) and 56.34 (I might be able to get down to this time). I entered at 57.00, which I have done in practice. I wanted to hold back a little on the first 50 and go all out on the last 50. I realized halfway down the pool on the first 50 that I went out WAY too slow. I tried picking it up on the second 25 and really went all out on the last 50. Gordon took some video and you can tell how much I had left in the tank because I caught a guy next to me on the last 25 that was pretty far ahead. I love hearing Gords and Goody cheering for me on the video! It's awesome to have such great team support. To show how slow I went out on the first 50, my splits were 28.47 and 29.41. I should have been at least 1 second faster on the first 50. Here are the meet results. Have you been to Masters Nationals? The nice thing about nationals is almost everyone fudges their times. Unless the rules have changed, you are allowed to swim three events without qualifying times as long as you make at least one qualifying time. I love Masters Nationals. I haven't been to Nationals, but would like to sometime. I was just using the qualifying times for goals. Where did you go when you swam Nationals?